Considered visual laboratories, the programs of Hiestand Galleries exhibit artworks that highlight timely, enlightening, and challenging exhibitions that consider the ever-changing world of contemporary visual expression. With over twenty exhibitions per year, the galleries feature artworks by national and international artists and designers, as well as work by undergraduate and graduate students in the Department of Art. Two national competitions in painting and sculpture bring the latest trends in the 21st century to the forefront. A vital Visiting Artist and Scholars program aligns with the exhibition programs, and connects students to the professional artist and critics in this capacities, including studio visits, lectures, and off-campus events. 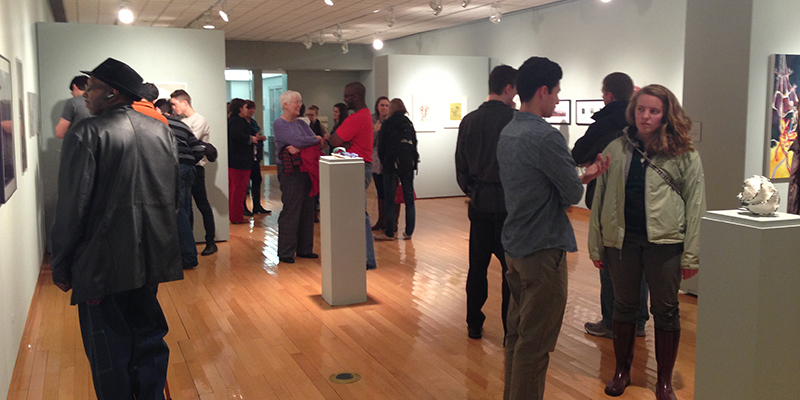 Exhibition opportunities are available in three galleries in Hiestand Hall and in the Art Building Lobby. Location: Hiestand Hall, off main lobby. May 15 – Aug 30. All receptions are in the lobby of Hiestand Galleries, Hiestand Hall, 401 Maple Street, Oxford, Ohio. Friday, Feb. 8 | Reception: 4:30 – 5:30 p.m., Award Ceremony: 5:00 p.m. Through the generous gift from William (MU1936) and Dorothy Yeck of Dayton, Ohio, Miami University has a unique opportunity to provide students and the community at large to develop a critical understanding of painting in the 21st century. The competition winner will be awarded the $10,000 William and Dorothy Yeck Award and the painting will become part of Miami University’s permanent collection. This year’s competition focuses on representational realism painting. 2019 Juror: Barry Schwabsky, art critic for The Nation and co-editor of international reviews for Artforum. 2019 Finalists: Erin Anderson, Riegelsville, Pennsylvania; Katelyn Chapman, Irmo, South Carolina; Alex Heilbron, Los Angeles, California; Cristina Marquez, Chicago, Illinois; Elmi L. Ventura Mata, Philadelphia, Pennsylvania; Lisa McCleary, New York, New York; Cameron Meade, Brooklyn, New York; Cait Porter, Richmond, Virginia; Amanda Smith, Omaha, Nebraska and William Wasserman, Los Angeles, California. Since 1999, Miami University has developed collections from the yearly Young Painters Competition and the Young Sculptors Biennial. 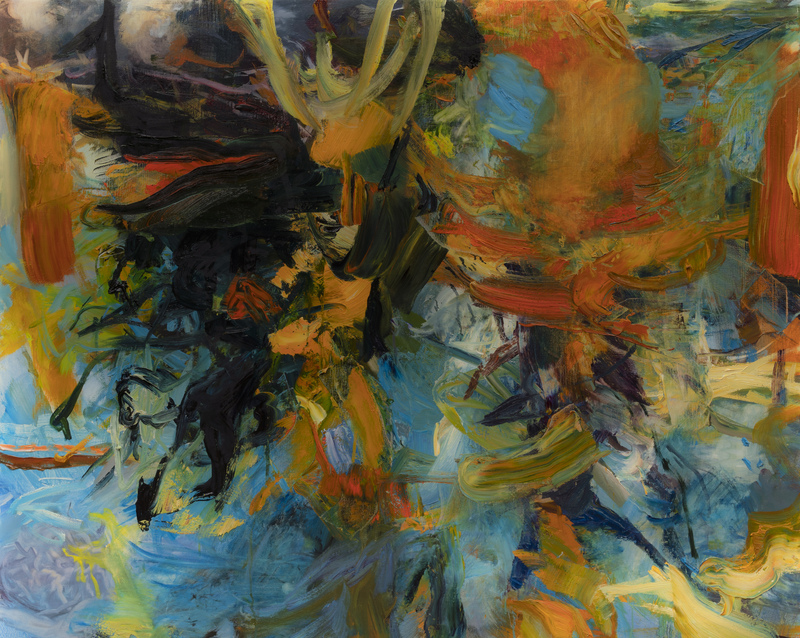 This exhibition will feature works by past winners of the $10,000 William and Dorothy Yeck Purchase Award. Thursday, May 2 | Reception for the Artists, 4:30-5:30 p.m.
Department of Art senior studio majors participating in the semester long Capstone course feature their latest visual investigations in the areas of ceramics, metals, painting, printmaking, photography, and sculpture. Chamber, 2018, oil on canvas, 48 x 60 in. 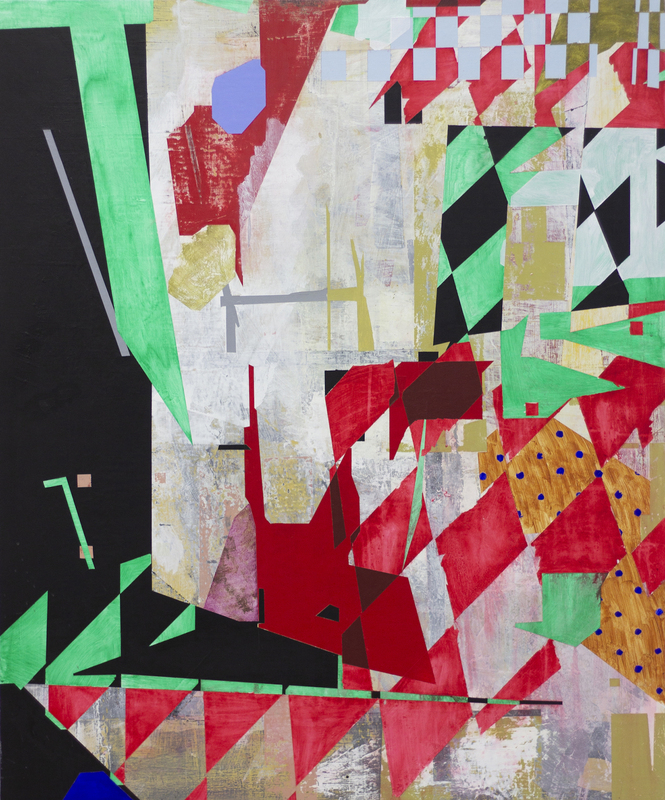 Friday, Feb. 8 | Reception for the Artist, 4:30 p.m.–5:30 p.m.
Jeane Cohen is the 2018 winner of the $10,000 Yeck Purchase Award as part of the Miami University Young Painters Competition. In Organon II, Cohen exhibits a body of paintings presenting a range of approaches to imaging organizational frameworks in nature. 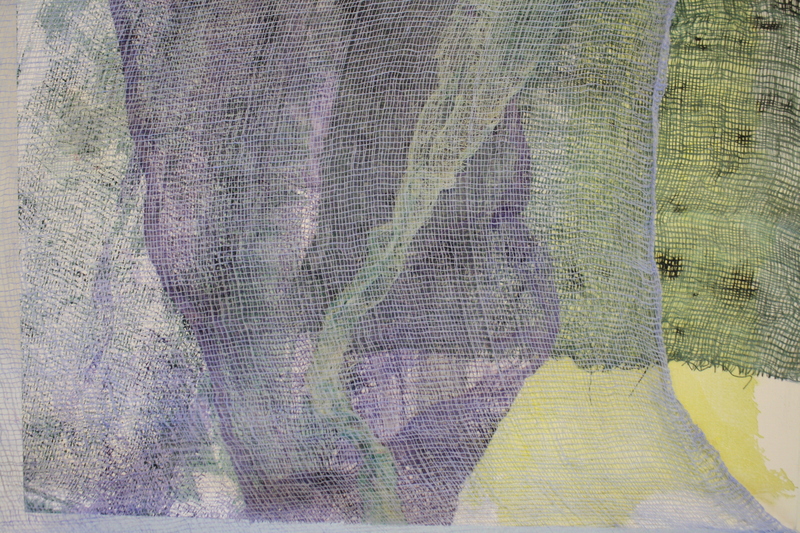 During the process of painting, a predominant agenda and direction emerges and the painting takes on a life of its own. The work incorporates approaches from different artistic and historic schools of thought, but aligns itself with no one method. This way the paintings are individuated from each other as well as within a given painting, such that the body of work develops into a pictorial ecosystem. Milieu, 2017, mixed media, 48 x 75 in. Tuesday, Mar. 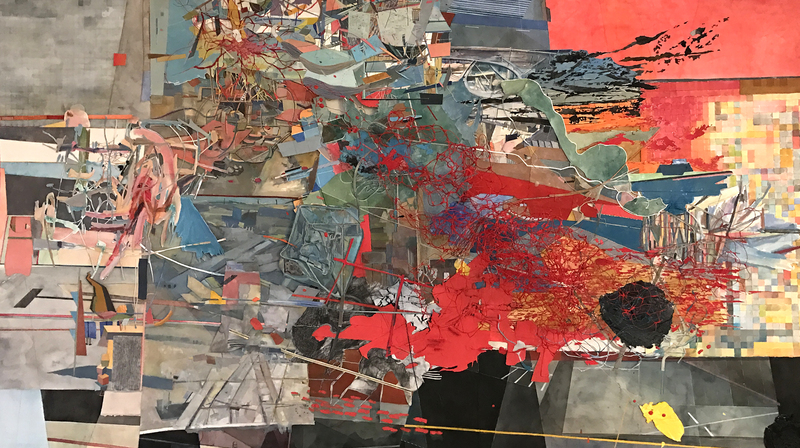 12 | Reception for the Artist, 4:00-5:00 p.m.
Joomi Chung’s recent project explores memory-space as a container of real/fictional, visceral/material, and narrative/abstract realities. Images from symbolic dreams, interpretations, and personal/public events are combined together through animation, mixed media collage, assemblage, drawing, and painting processes. Avenue, 2018, oil on canvas, 8 x 6 in. Tuesday, May 8 | Reception for the Artists, 4:30-5:30 p.m.